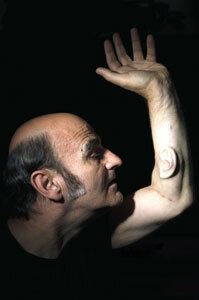 Went to a lecture at FACT Liverpool last night by Stelarc. This chap messes around with his body in the name of art. Stelarc is a Greek/Australian-based performance artist incorporated themes of cyborgization and other human-machine interfaces; it is amazing, strong stuff. He talked about the blurring of boundaries between dead and undead (us or zombies?) and at what stage you cease to become yourself for example if your body was to be made up almost entirely of prosthetics. At what point do we accept that we have become machines? Companies will now deep freeze your body perhaps to be resurrected in a few hundred years time or for a reduced price…. just the head. He has experimented with a third arm and linked himself up to the internet and invited users to manipulate his arm via electronic links his body. Stelarc has a neat party trick, if the conversation on the bus ever gets boring he can always roll up his sleeve and enquire ” have you seen my third ear?” Yes, stelarc is growing an ear on his arm. The next step is to wire up the arm ear with a microphone which is WiFi enabled so that people can listen in via the arm ear. Its not ‘his’ ear but an ear to be used by others. There followed a fascinating conversation between Liz Carr an Abnormally Funny Person and Stelarc about the body, its boundaries and the the use of the third ear (This was part of the amazing DaDaFest in Liverpool). I am interested in the human body as someone who enjoys thinking about bacteria and other such stuff buzzing around in and on our bodies. Some scientists have done calculations on the back of an envelope and decided that our own body cells are outnumbered by bacterial cells by 10 to 1. So basically ‘we’ are only 10% human, so like Stelarc I like to blur boundaries of what it is to be human but coming from a different angle. When you also consider that part of the main machinery inside all our own cells (mitochondria) was originally free living bacteria that were taken inside our cells then our body is mainly a sort of walking blob of microbes. I like to think of the human body as a living ecosystem; a community of organisms with ourselves at the centre with microbes interacting with each other and our selves. There is even socialising going on between the bugs in our bodies…..yes bacteria communicate with each other, having arguments and the occasional fight and sometimes turn on us and we then call them ‘pathogens’ that give us disease. It gets more bizzare when you find out that obese people have a certain bug community in their gut that differs from that of thinner people; its all about certain bacteria being more efficient at getting nutrients from food and passing on the calories to us. So our microbial community in our body is changing and influencing our lives in ways that we are only just beginning to understand. Bonnie Bassler discovered that bacteria \”talk\” to each other, using a chemical language that lets them coordinate defense and mount attacks. PreviousWhat’s in a name? What’s a Sandfly?